If your heart is set on having a Resto-Mod with a top that goes down, you're going to build a rare vehicle. Convertible muscle cars were low-production items in the '60s and '70s. Fast take off and fabric tops didn't go well together. However, Detroit did build open-air muscle machines in relatively small numbers. You'll probably find more Mustang, Camaro and Chevelle convertibles around today than you will 'Cudas or Cougars. Survival rates tend to directly follow the original sales figures. 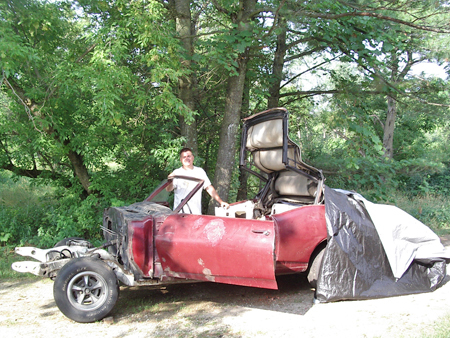 If you are lucky enough to find one, building a convertible into a Resto-Mod is going to increase the difficulty and cost of your restoration. Muscle car convertibles are rare. If you want one, you may have to start with a car that needs just about everything restored, including the convertible top. R & R gaskets, seals, latches, special hardware, etc. 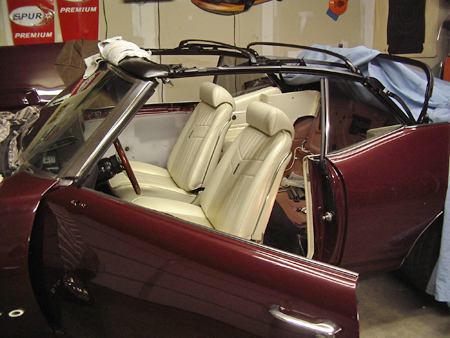 Convertible top frames are subject to a lot of ordinary abuse as they do their job. Broken nuts and bolts, rivets, screws and grommets are common. Bushing wear out from years of raising and lowering the top. Paint on the bows can easily get scratched, permitting oxidation to begin. The bows themselves can be damaged because the wear and tear on other parts throws the geometry off. Top frame repair kits are available for some popular muscle cars. These provide every piece needed to replace all of the old hardware with new parts. Suppliers of multi-make automotive hardware such as Restoration Specialties & Supply, Inc. (www.restorationspecialties.com) maybe able to help get the parts you need if there's no pre-packaged kit for your car. The hardware from a still-assembled top frame can often be replaced a piece at a time, but most builders will want to disassemble the frame to paint it and replace all hardware at once. Even though Jim Mokwa had a pretty good top frame, it had rivets that needed replacement and the fabric top was badly in need of replacement. When you take a frame apart, it will involve drilling out rivets, as well as removing nuts and washers from bolts. Some of the "bolts" may actually be special pivots—sometimes multi-diameter—that are designed to go through several different size holes in different pieces. These may or may not be threaded at the end. If you remove a pivot or fastener and the hole that it went through is egg-shaped, its roundness will have to be renewed by replacing the part, welding and re-drilling the hole or using some kind of bushing. An egg-shaped hole will throw off the entire geometry of the top and cause problems. 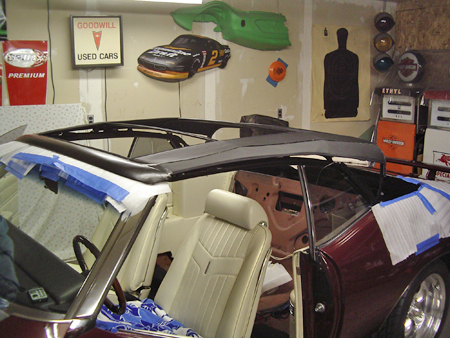 Many restorers rush to paint convertible top frames flat black or some neutral color like gray or beige. 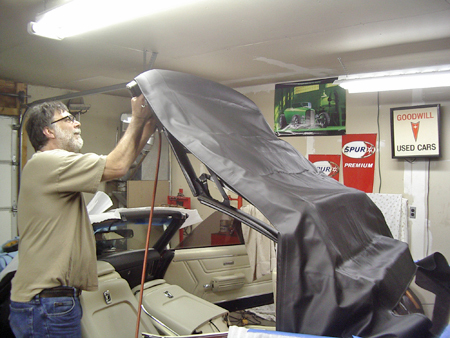 However, classic car collectors have documented many cases where the OEM automakers color matched the convertible top frame with the color of the top fabric. While color coordinated convertibles may have been out of vogue by the time the muscle car era arrived, the coordinated combos really looked cool and there's no reason why you can't revive the use of color when you build your Resto-Mod. After all, with such cars, looks count more than OEM correctness. That's why you see white-topped cars with white bows taking home trophies. Chrome- or copper-plated bows might not look bad either. GTO's original top frame was cleaned, painted and rebuilt. Reproductions of the chrome plated top latches are available for '69 GTOs. Start disassembling your convertible top frame by removing all of the hardware that can be removed using only simple hand tools. Don't remove any original rivets or spot welds until later. You'll probably have well over a dozen parts like various bows, the scissor assemblies and two side frames. Take digital photos as you disassemble. A great way to organize smaller parts and fasteners as they come off is to get a piece of cardboard, drill or poke holes in it and put the items removed into the holes. Put re-assembly notes right on the cardboard. Save any of the old parts that can either be reused or used to make copies. Clean paint off the old pieces in your media blasting cabinet or take them to a commercial blaster. As you know, blasting will not remove rust. It can be dealt with the same ways you took care of rust while fixing the body. Then prime, sand and paint the bows like you did your body panels. Considering the wear and tear these parts might be subjected to, you may want to replace the painting step with application of a powder coat. You can hire this job out to a powder coating shop or buy a home powder coating kit from Eastwood Tool or Harbor Freight. In your spare time, search in hobby publications or on the Internet to see if you can come up with a convertible top manual or complete factory assembly manual (including top parts) for your car. It will be a big help during re-assembly. If you are lucky enough to score a convertible top manual, it will specify the correct order for assembling the dozens of parts and hardware items that make up the top. If you can't find a manual, you'll need to count on your restoration skills, along with a dose of common sense, to figure out how the top gets built. In a very real sense, a convertible top frame is like a bridge and thinking of it in that way will help you visualize how it should be constructed. You will have to check the fit of the side glass against the rebuilt top frame to avoid breaking the glass when the side window is raised. If you decide to fix up a convertible as a Resto-Mod and it needs a new convertible top, you can do one of three things: 1). Pay a shop up to $2,000 to install a top, 2.) Use the sagging old top as a pattern to try to make a new one and pray you succeed or 3. Go the smart way and get a ready-cut kit that's pretty easy to install. Top kits can also be found in magazine ads, mail-order catalogs or on the Internet. Be sure to get a top made for the year and model of your car. For proper geometry use spacer sticks between bows or take a bow height measurement from center of top frame to center of the rear body tub. 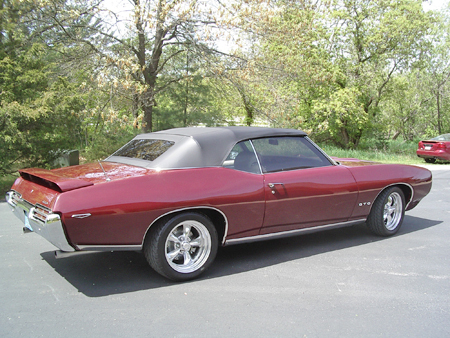 Listed here are the contents of two typical convertible top kits available for 1968-1972 Pontiac LeMans and GTO models. The plastic rear window kit sells for around $300. The glass rear window kit sells for around $400. It includes a glass rear window that won't scratch as easily as a plastic one. The prices may seem more reasonable than you expected, but they do not include what a professional installer will charge to put a top on. Install costs are usually based on time and materials. Time is often a lot more expensive than the materials are. It's wise to tape masking paper over the glass rear window to protect the new glass until you are finished working on car. Pick your favorite available color. With some manufacturers you'll have to decide whether you want single-, double-, or triple-texture fabric. Double-texture material is probably the best bet for do-it-yourselfers since it is thin enough to work with and thick enough to last. Some people prefer canvas, but many canvas tops will stain, fade and wear fast. Vinyl-coated fabrics are best in most cases. New convertible top pads are recommended if the old top has the "starved-cow" look. The pads hold a frame in proper position and protect the top from damage due to wind buffeting and repeated "ups and downs." Most people are likely to describe the pads as "webbing," but the technical name is pads. The term top pad or stay pad refers to the covered foam or the padded webbing that runs under the top and along the edges of the top frame. A new curtain window and backlight are not included in many kits. Check to see if you need them (you probably will). You may need new cables, tacking strip, hardware, wire-on and a front roll. You'll need an air-powered upholstery stapler to do some tops and others can be installed using a hand stapler, if they have a softer tacking strip material. Stainless steel staples are a must to prevent rusting. You will also need cement, trim adhesive, razor blades and a yardstick. 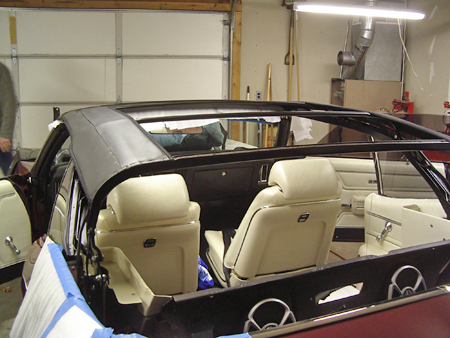 Convertible top installation techniques vary widely by car and installer. On some cars, the factory shop manual will explain how to fabricate spacer sticks to hold the top rails in proper alignment. On others you'll have to measure bow height with a yardstick. Since shop and repair manuals can include a few errors, use more than one how-to guide for convertible top installs. 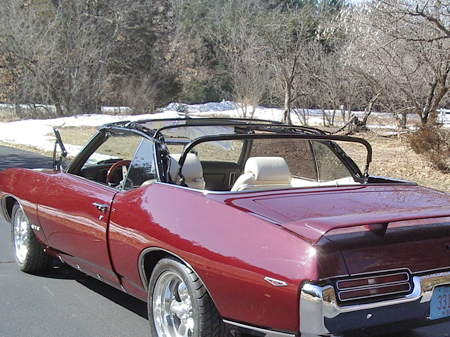 The Internet has many good tips for installing convertible top kits. Eastwood (www.eastwood.com) sells a general how-to-install-a-top video by movie-car customizer Eddie Paul. Start by removing moldings from the rear of the body well. 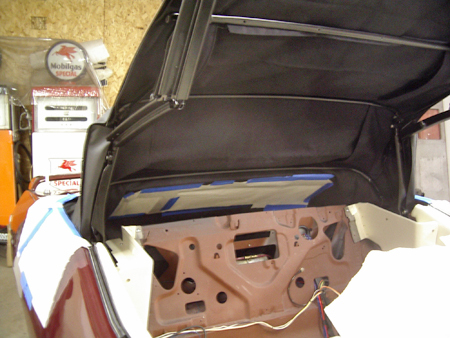 Cover the deck lid, then remove the molding fasteners. Put them in a baggies, along with slips of paper with re-installation notes written on them. Use a grease pen to mark where screws and moldings hit the old top. If you're unsure of yourself, take photos or make sketches of the way things fit together. Lift the top and remove the roll strip at the front. Take out all staples and screws. Save screws and other hardware. Remove the rubber weatherstripping from the side rails, the glued-on quarter flaps and one end of each cable. If the top is attached to the middle bows, remove the attaching screws and the listings. The listings are thin rails that slide through "pockets" sewn inside the top and then screw into the roof bows. They fasten the top to the middle bows. Dave Kasper uses an air stapler and stainless steel staples to attach the front of the new convertible top to the header bar. Latch the top to the windshield header. Remove the wire-on from the rear bow. Remove all staples so they don't poke through your new top. Remove or pull back the well cover to get at the fasteners below it. On some cars removing the fasteners loosens a removable metal tacking rail. 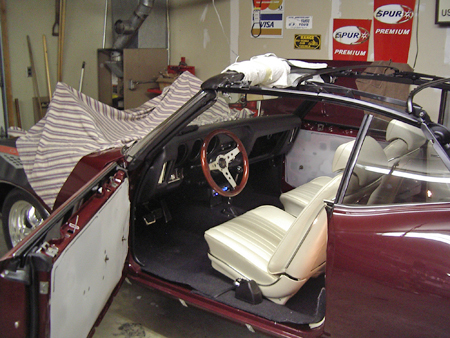 Some convertibles use plastic tacking strips riveted to the outer edge of the body well. If you have broken sections that need replacing, it will require drilling the rivets, getting a new tacking strip and riveting it in place. Regardless of the tacking system, you should loosen everything enough to allow removal of the old top. All staples that hold the bottom rear edge of the top to the tacking strip must be removed. Any old staples left anywhere can windup piercing the new top and causing tears or water leaks. If you are installing new pads without spacer sticks, remove one pad and use your yardstick to measure bow-height. You should be able to check the measurement with the manufacturer of the top kit. Staple your first new pad to the roof bows. It will hold the frame in alignment as you install the second pad. Remove the rear curtain. Mark the center of the rear bow. The new curtain will have a notch to line up with your mark. Staple the curtain to the bow from the center, pulling wrinkles as you move towards the edges. Unlatch the top and prop it up. Fasten the bottom of the curtain and window to the tacking strip with the tacking rail or other retainer. Close and latch the front and make adjustments. Before installing the new top, lay it on a clean floor under the old top. Transfer reference marks like bolt holes and tacking strip locations to the new top with a laundry marker so the markings can be removed later on. Now put the new top over the old one and compare reference marks. If you see differences, use half the distance between the two marks as your final reference. It is good practice to install a top in a warm environment. Heat softens the fabric and makes it easier to stretch into proper position. Crank up the heat in your shop the night before top-installation day. Careful use of a heat gun will help greatly with the wrinkle-free installation of a plastic curtain window, but too much heat can burn the window. The gun should be kept at least six inches away and moved in a swirling motion to avoid putting too much heat in one spot. Position the top over the framework until it sits right. Secure the top to the No. 2 and No. 3 roof bows with listings. Raise the top off the windshield header and attach all cables. Center the top valance over the No. 4 bow and staple it on, working from the center out. Pull out fullness and wrinkles. Using screws and contact cement, fasten the quarter flaps in position. Re-install weather stripping along the side rails, using screws and trim adhesive to hold it in place. Latch the top to the windshield and pull the fabric gently over the No. 1 bow. Use a pencil to mark its position. Raise the top and pull the fabric past the reference mark as indicated in the instructions for you car (usually about a quarter inch). Secure it to the bow with screws, staples and glue. At each step, check for proper top appearance and operation. Next, install the roll at the front that overlaps the windshield header. Contact cement is used to glue the roll in place and it is then stapled from below. With top latched, look over the top and see if it fits straight and evenly on both sides. Make any necessary adjustments. When everything looks right, begin stapling the new fabric to the tacking strip. Start at the front of the tacking strip and move to the rear. Use only a few staples so you can make pulls and adjustments as you move around the curved sections. Try to eliminate wrinkles. Avoid excessive stretching. Keep the top material flat. You may find a "feature strip" on the convertible top rear bow. This molding is covered with the same cloth as the top, It slides over an aluminum molding. The aluminum molding screws into the bow. On some cars you'll be able to clean this strip and reuse it. On others, the feature strip may be too old to reuse and you can substitute the "wire on" that comes with the convertible top kit. Wire on is the name for a folded-over fabric strip or molding designed to hide the staples holding the top to the No. 4 bow. Make sure you install it with the fold to the front, so the wind won't unfold it. After installing the feature strip or stapling the wire on in place, install the decorative end caps on each end of the feature strip or wire on. Use a silicone sealer for waterproofing. Make holes for the belt molding studs in the bottom edges of the top and backlight and line them up with the holes in the tacking strip. Install fasteners on the studs where they protrude inside the body well. Then re-install fasteners that hold the well cover in position. Install the plastic trunk gutter molding and any remaining exterior body moldings that trim the edge of convertible top well. Jim Mokwa's '69 GTO wound up with a great looking, great fitting convertible top. Clean the areas of the car you've been working in. Remove protective coverings from the trunk lid, if you used them. Leave the top up for several days to allow it to set into position. 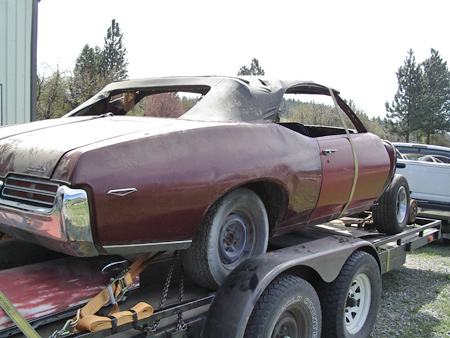 Repairing or replacing things like convertible roof rail seals (try Steele Rubber) and convertible top hardware (try muscle car parts catalogs or Restoration Specialties) is mostly a question of tracking down parts sources. New latches (the ones that lock the front of the roof to the windshield header) are being reproduced for some, but not all, muscle cars. Check with Hydro-E-Lectric of Punta Gorda, Florida, on the availability of latches for Mustangs or GM cars. On most muscle cars, the convertible top motor resides behind the rear seat. The seat bottom must be removed first. Most are held in place by a spring latch setup and come right out with a good shove. Then you gain access to the bolts that hold the seat back in place. If you un-tighten them, the seat comes out. Use a wrench to detach the bolts holding the top motor in place. Loosen the clips that hold the hydraulic lines and then use a six-point socket wrench to undo lines. Be ready to catch any leaking hydraulic fluid with an old shop towel or can. Unplug the wiring going to the old top motor and take the motor out. Installing a new motor is the reverse of this process. You can get hydraulic top motor pump, as well as hydraulic top cylinders, top hose sets and convertible top latches for many classic cars from Hydro-E-Lectric (www.hydroe.com). 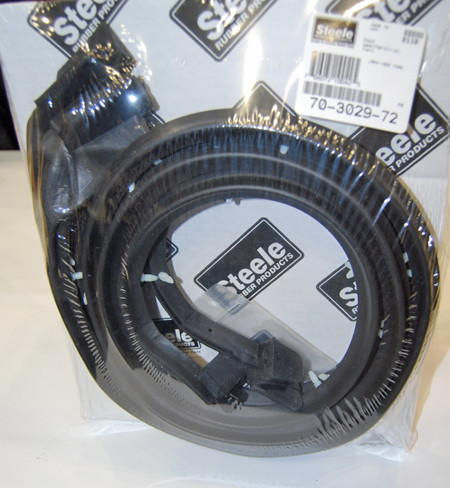 Steele Runner of Denver, North Carolina, makes convertible top seals for many open-air muscle cars. If the rods in the top cylinders are in, it is going to take 50-60 psi of pressure to push them out. There's no need to force them. The convertible top motor can supply the pressure needed to fill the cylinders to 75 percent of their capacity. Fluid that seeps out the vent hole can be saved. The fluid in the reservoir of the top motor goes into the cylinders, causing the rods to move. You'll see one go up and down before the other. Keep doing this until the rods move fully in or out. If they are in the out position, stop running the pump. Keep up this process, refilling the cylinder to 75 percent full. When you can't add more fluid, pull the rods back into the cylinders. Do a final check for your 75 percent fluid level, then retract the rods and screw the plug into the reservoir opening. With the pump, run the rods out so they can be attached to the top. Bolt the rods to the top. Assuming no other problems, your top will now work.